Heat the oil in a heavy-based saucepan over medium-high heat. Add half of the butter. Add quails and cook for 3-4 minutes each side or until browned all over. Remove the quails from the pan. Add the shallot and bacon. Cook, stirring, for 1 minute. Add the wine and bring to the boil. Boil for 1 minute. Return the quails to the pan. Add the stock and chestnuts, and season with salt and pepper. Reduce heat to low, cover and cook for 10 minutes. Meanwhile, drop grapes into boiling water for 1-2 seconds, then drain. Remove quails and chestnuts from the pan. Bring cooking juices to the boil, and cook until reduced to about ¼ cup. Stir in remaining butter. Return quails and chestnuts to pan. Add grapes. Reheat for about 5 minutes. 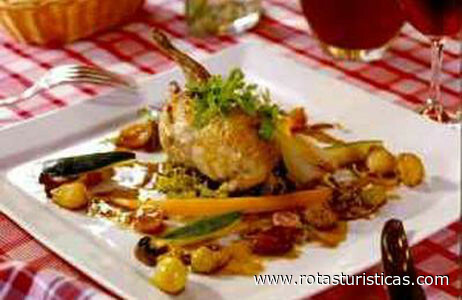 Serve quails with chestnuts, grapes and sauce. Sprinkle with parsley to garnish.